Wednesday 9th December 2009, 6:30 pm. This talk is free of charge. Refreshments available from 6:00 pm. One of the Second World War's most fascinating stories is that of the Enigma machine, a portable encryption device widely used by the Germans, whose ciphers they believed to be totally secure. Nevertheless, by mathematical analysis and modern technology (and a certain amount of good luck), the Allies devised techniques for 'breaking' Enigma ciphers, and thus read several million German messages, providing a wealth of reliable Intelligence. The attack on Enigma, initiated by the Poles in the 1930s, was later perfected by the British at Bletchley Park, today open to the public as a museum site. The Intelligence gained was of immense value to the Allies in virtually every theatre of war, but nowhere more so than in the Battle of the Atlantic, that fierce conflict which lasted nearly six years and cost over 60,000 lives. Dr Baldwin uses the Battle of the Atlantic to exemplify the importance of codebreaking in winning the war. After the presentation, the audience are invited to take part in a hands-on practical demonstration of one of the few surviving Enigma machines. Only about 200 are known to survive worldwide; of these, only about a dozen are in public collections in Britain. As these machines are so rare, Dr Baldwin is providing a unusual opportunity for the audience not just to view, but also to operate, an original 4-rotor Enigma machine (i.e. the more sophisticated model, developed for the U-Boat service in 1942). This is of particular interest, as there is no working machine on permanent public display anywhere in England north of Bletchley Park, and nowhere at all in Wales or Ireland. [The National Museum of Scotland does have a 4 rotor machine that is currently on display in the "Wonderful Things" section of level 5]. After graduating from Cambridge University in Mechanical Sciences (with Honours), Mark Baldwin worked for a consulting civil engineering firm on a variety of projects, including London's Victoria Line, and Newcastle's Central Motorway East. On achieving chartered status, he enrolled as a postgraduate student at Imperial College, London, and obtained a Master's Degree in Soil Mechanics (with Distinction). Accepting the offer of a lectureship at Imperial, he spent 15 years on the Civil Engineering Department staff, with particular respon-sibility for the undergraduate course 'Engineering & the Environment'. During this time, he was awarded a doctorate for his thesis on modern commercial inland waterways. In 1986, he and his family moved to Shropshire to develop the book-selling and publishing business which he had established with his wife as a part-time venture in 1978. The Baldwins' bookshop is largely second-hand, holding a general stock. However, one important speciality is WW2 Intelligence & Codebreaking, and they have published six books on this subject. For over ten years, Dr Baldwin has spoken widely on WW2 Intelligence, focussing especially on the story of the Enigma machine and Bletchley Park. These presentations have been warmly received at venues from Pitlochry and Edinburgh to Birmingham, Ipswich, Hastings, Falmouth, Belfast, and the Channel Islands, by a variety of audiences including professional, commercial, and educational, as well as the general public in theatres and festivals. A Polish lecture tour in 2004 was particularly well received, as no other Englishman had ever toured Poland with an Enigma machine, and in 2005 he spoke in Germany itself. In 2006 he mounted an Enigma display for the Imperial War Museum travelling exhibition in Shrewsbury, and gave a series of lectures on 'The Secret War' aboard a cruise ship. In 2008 he delivered 50 presentations, including a second Polish lecture tour, and this year he has delivered another 'Secret War' series on a cruise ship, and mounted an Enigma display at RAF Cosford's Air Show. He also has further engagements to speak at venues from Northampton to Brussels, Wells and Derby. 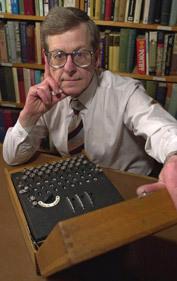 Having delivered 270 presentations, he is currently one of Britain's most experienced speakers on the Enigma machine and the work of the WW2 codebreakers.